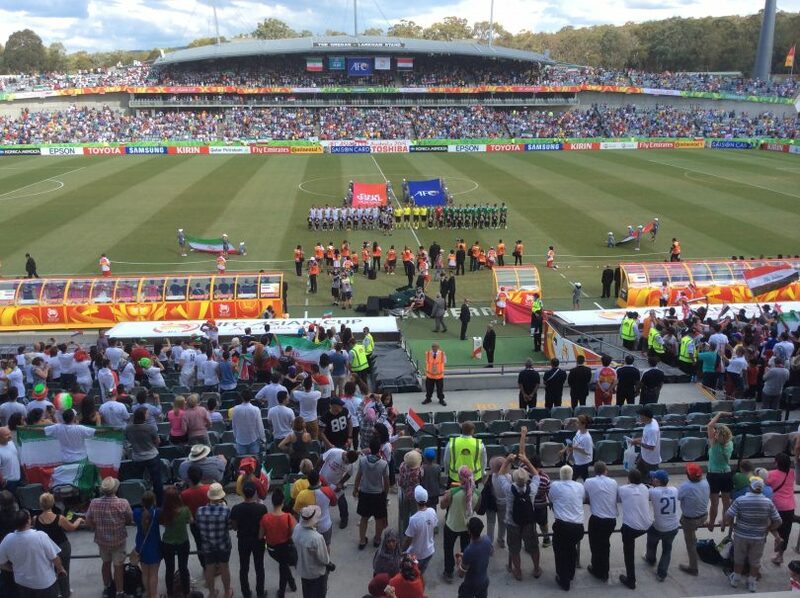 Asian Cup 2015 at Canberra Stadium. Photo: Tim Gavel. When the bid for an A-League side ‘mark 2’ was first mooted I was one of the first to write it off. There was a perception that it lacked energy and was doomed to fail. This is in part due to the fact that Football Federation Australia showed their hand the last time Canberra launched a campaign to be part of the competition in 2008 only to see the licence handed to the Western Sydney Wanderers. That was a ‘captain’s pick’ if ever there was one with the Wanderers parachuted over the top of Canberra to be part of the A-League. The argument presented was that there were doubts about Canberra’s financial viability and the size of the catchment area. If nothing else, it created doubts as to whether Canberra was ever going to be taken seriously in terms of being part of the national league until our population reached a critical mass of at least 500,000. Fast forward five months and that perception has been blown out of the water with the Canberra bid being one of the ten bids shortlisted for inclusion in an expanded A-League in 2019/20. So what has changed? Why is this bid looking viable when the previous bid wasn’t? The Community Ownership model is part of it but one of the game changers has been the apparent ability to attract funds and business interest to ensure the team is sustainable. Michael Caggiano joining the bid team was another turning point. He has the ability to leverage his existing business relationships towards a potential Canberra football team. Before proceeding further, it is worth presenting a cautionary tale about the previous Canberra teams in the national men’s soccer league. Canberra City was part of the NSL from 1977 to 1986. There was then a hiatus until the emergence of the Canberra Cosmos in the 1995/96 season, until 2001. The Cosmos experience has had a lasting impact on many in the Canberra football community. It is possibly the reason why some were not keen to come on board initially, rather than because of the failed bid in 2008. It started with good intentions as a community model but in the end folded because of financial problems. Towards the end, covering that Cosmos as a journalist wasn’t easy because I wasn’t sure who was in charge, as the club went pear-shaped. In fact, the team was kicked out after the 2000/2001 season only to be readmitted, but the initial decision by the governing body made it virtually impossible for the Cosmos to regain lost ground and the club disappeared before the season got underway. There was a revolving door of coaches at one stage as the club struggled on and off the field. Cosmos finished last three years in a row and failed to attract substantial crowds. That gives you an impression of what Ivan Slavich and the original bid was up against, followed by this latest campaign. It hasn’t been easy to change the perceptions of some involved in the code that had a first-hand experience of what life was like during the latter stages of the Cosmos. They worked so hard to keep the team afloat under trying circumstances, which at times were out of their control. Which brings us to the present and Canberra with a bold confident bid representing not just the ACT but Southern NSW. The reason why I think Canberra needs an A-League side is not just confined to the obvious, which is the competition can’t truly call itself national unless it includes the nation’s capital. Football remains an untapped sleeping giant in this city. For one, it is the biggest sport for juniors. Imagine if you were able to convert these numbers into supporting a Canberra team in the A-League? You just need to ensure there is a pathway for juniors and there isn’t a perception that big money is going to players who are drawn from outside the ACT and district. There is support for the code here. We have seen it in the past when there was a call to arms to attend a Socceroos’ game at Canberra Stadium in the lead-up to the last bid. Twenty thousand people turned up. There was also the success of the Asian Cup and the support received by Canberra United in the W League. 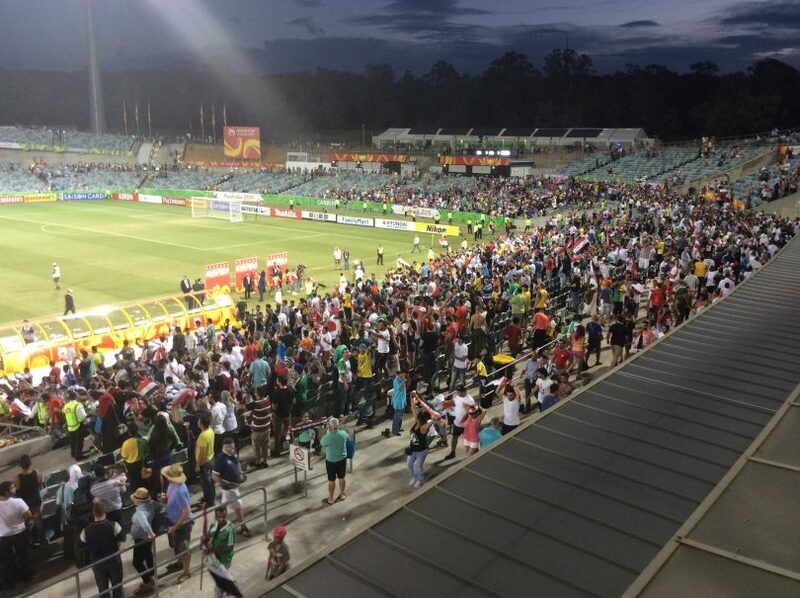 Crowd at Canberra Stadium, Asian Cup 2015. Photo: Tim Gavel. Games involving teams such as the Wellington Phoenix and the Central Coast Mariners at Canberra Stadium struggled because there was a feeling that they were only here because the ACT Government underwrote it and the people of Canberra felt as though the teams had no real attachment to the city. The Brumbies and the Raiders should be right behind this bid as well with the Chief Minister indicating that an A-League team would improve the prospect of building an Indoor stadium in Civic. I agree with Michael Caggiano who has stated that if all the bids are financially viable, why limit expansion to just two teams. It could also be an option to have the unsuccessful bidders putting their resources into a strong second-tier competition. Hopefully the bid has awoken a sleeping giant. The current broadcast deal gives Foxtel an effective veto over where the new teams will come from. The two teams are likely to come from Sydney and Melbourne, for obvious reasons, with Brisbane being an outside chance. Everyone else can forget about it. The other thing is that the two new teams will not be given a share of the current broadcast deal, that’s basically four years during which the new clubs need to make up some $3.2 million per annum, not to mention the upfront license fee will be around the $10 mill mark. So, unless an oil baron is stepping in to fund the team for the next four years to the tune of tens of millions of dollars, it’s pie in the sky. We don’t have any “oil-barons” but we do have a sports mad chief minister and he is already supporting the bid financially via CBR. Next thing Canberra University and/or Actew will pledge a few million. I am glad you have pointed out the financial realities of any deal with the A league. It’s the same principle that prevents so few telecasts of Raiders games. It’s all about selling viewers. Money has ruined all sports. I hope they practice their Neymars. We need health and education though whereas we don’t need a tram. Why should Canberra be left out of the national football league? Football is the most popular sport in Australia, and Canberra has more of a global outlook than any other city, I suggest. I don’t know where you got that information but it is certainly the most boring sport in Australia. Most other countries that it is played in only think it is great because they don’t play anything else. We could have a Tuggeranong based team (The Forgottens) and a Gungahlin based one (The Trammers). The clashes could be at Sieffert in Queanbeyan for neutrality. That tram gets blamed for everything, yet its less than 1% of the ACT budget. Health and education gets about 2/3rds of the budget. Just a correction, but an important one. The previous bid was overlooked in favour of a bid called West Sydney Rovers (not Wanderers) which couldn't actually form a club and ended up folding. Which was even more of an insult, since the idea that Canberra's bid wasn't viable was rich when the one they gave it to folded straight away. The Wanderers didn't get formed until Clive Palmer had his Gold Coast licence taken off him and didn't even go through a bidding process, FFA just started it themselves. Again - salt into the wounds because clearly no one but west Sydney was ever going to get up. That would have been fine if they hadn't held a sham process. But my full support goes to this Canberra bid - a team would be a massive boost to our city and football fans. Have you done the survey? No!!?? They’re announcing the decision October.. too late? I want the Canberra Cannons back as well! Yes we should have a team. We have quality juniors, a good base of support, and it would increase the opportunity for an all weather roofed stadium. While I don’t like Rugby I do go to every cricket and AFL game in Canberra and would attend the football happily. It was tried before and failed. What has changed? Canberra’s population has grown by about 115,000 since the cosmos folded. Not sure it’s enough, but it’s something. Michael Rankins I wish the very best of luck. Not yet. Five years maybe. But we do, don’t we? GWS, who we pay a ridiculous $700K for every game they play at Manuka, are our national team. They may not live or train here which makes it even more ridiculous but this is what professional “sport” has devolved to. A national FFA team from Canberra would follow the same model I’m afraid. Tried and failed. Who remembers the Canberra Cosmos? Yes. Let's hope we are not overlooked again.